GUI interface in Python3 +Tkinter. Simple ADC.. It is incredibly easy to get a simple ADC able to read sensor devices whose resistance is changed by some physical property- with just a pair of components. The image shows a continuous display of the sensor in a GUI window. 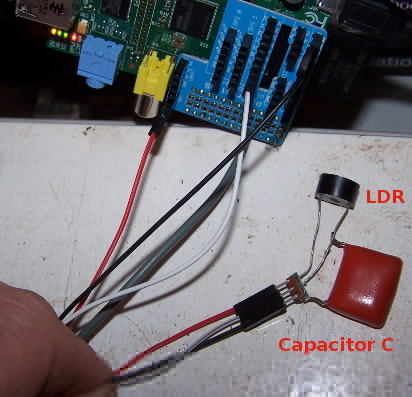 All you need is say a LDR from +3.3V in series with a capacitor of say 0.1uF to earth. The junction goes to Pi pin 18. A simple Python3 program discharges the capacitor, then counts up as it recharges, saving the count when it passes the CPU GPIO input threshold voltage. I chose to average the new reading with the previous one, to provide some smoothing but still a reasonably fast response. The rest of the program just creates a Tkinter GUI display and calls the read routine at regular intervals. You could of course instead save the values to a csv file for analysis; or display graphically on screen. Programming this helped me understand, among other things-Pythonesque, the ideas of operator overloading and of string-slicing and overlooading. If sent to a fan-fold old-fashined printer this makes a very impressive chart recorder!! #   Assumes a LDR from +3.3V in series with capacitor of 0.1uF to ground. Junction to pin 18. GPIO.output( RCpin, GPIO.LOW)           #   ...after first being pulled low & discharged. def measure():  #   smooth data by loaded average of new and previous reading. meter.config( text ='%4.1f' % runAve)   #   format to 1 d.p. meter.after( 1000, measure)             #   re-do after 1 second. As always, e-mail me if you meet problems or have suggestions.